Which Is Better: Drive-Thru or Delivery? Before you jump to the poll at the bottom of this post, let me explain exactly what I’m asking for here. Actually, let me start with what I’m not asking: Specifically, I’m not asking which type of food is better. I think we can safely agree that the vast majority of all food you get in a drive-thru or via delivery is pretty disgusting. Delicious, but disgusting. So let’s leave what you’re actually consuming out of this debate. Also, not all drive thrus and delivery services are for food. There are drive-thru pharmacies and banks. There are drive-thru Starbucks. There’ even a drive-thru liquor place called Brew-Thru on the east coast. And delivery…you can get pretty much anything delivered. 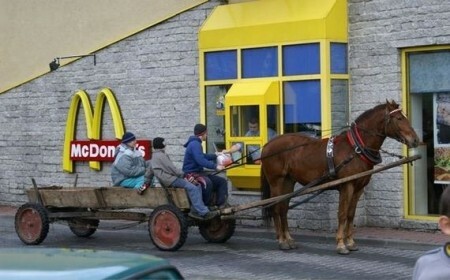 So let’s get to what I’m actually asking: Which is the better innovation, the drive-thru or the delivery service? At first when I considered this question, the answer seemed obvious. Of course delivery is better. You don’t have to go anywhere for delivery. You pick up the phone or go online, and 45 minutes later the thing/food/person arrives at you door. It’s amazing. But here’s the thing: You are not always at home. Even recluses have to drive past a Taco Bell every now and then. Therein lies the glory of drive-thrus: They’re on your way to where you’re going. You don’t have to wait to arrive to get the thing/food/person. You get it immediately. That’s why french fry containers are open on one end: You can enjoy them in the car when they’re hot and crispy, long before they get cold and soggy and you start to question your life. And you never have to leave your car to get those fries. Thus I think it’s a legitimate question: Which is better? You tell me. This entry was posted on Tuesday, November 5th, 2013 at 10:22 pm	and is filed under poll and tagged with debate. You can follow any responses to this entry through the RSS 2.0 feed. I fall squarely on the drive through side of this debate, and I’d like to present my case for other readers. First, I acknowledge that the food I get via drive through our delivery is not finely prepared cuisine–it is fast food, like Taco Bell for drive through or pizza/Chinese food for delivery. The important corollary to this point is that it is inexpensive, and one of my greatest pet peeves is the requisite tip (and occasional delivery fee) that accompany delivery. In my mind, the extra $2-4 always drives up the price of delivery significantly, to the point where I feel like I’m no longer getting a good deal. Therefore, I chose drive through, and I advocate on its behalf! That’s a great point about the delivery fee. There’s no tipping at a drive-thru!